Finally after a lot of tinkering and delays the VC Sequencer is out on sale! We have sorted Escape From Noise out with modules and they are available as we speak, also we're working on getting orders away to a few more vendors. You will also find kits in stock in our webshop here. Please note however that because we're very busy at the moment orders from our webshop might take longer than from vendors. So, what is the VC Sequencer? A compact 8-stage CV sequencer with voltage controlled stage addressing as well as classic clocked modes in forward and reverse. The circuitry is all CMOS and Op-amp based which gives you excellent timing and good audio rate properties in a compact 10hp module with a depth below 45mm. It is available as kit and assembled module, and there will shortly be a pcb only option too. Also on board are two expansion headers, one is for adding more channels to the sequencer, the first expansion for this will be the Trig/Gate expansion which gives you a channel of 8 separate trigger/gate outputs as well as a clock output that gives you a clock pulse for each step the sequencer advances, this module is 4hp wide and will be available shortly. The second expansion header is for an upcoming module designed to chain two VC Sequencers together for 16-step operation. We hope you will enjoy the RYO VC Sequencer! You forgot to include the schematic (or at least I couldn't find it). Are the kits full kits (including the semiconductors)? Some of them may be hard to source in other parts of the world. I'm not PR for RYO or anything but the two kits I bought were complete, from resistors to panels to knobs - I'm pretty sure that is the case here. Any idea when the PCB only option will be available? The kits are full kits with all the boards, panel, components etc to build a complete eurorack module. You will only need solder and tools. PCB only option will be available within 2-3 weeks at our webshop and/or vendors. oh, i had no idea you were also going to offer just pcbs. panels, too? We will offer panels too. Not all DIY focused vendors want to stock panels when kits are available though and we will not keep our own store open longer than until we feel secure about the distribution coverage via vendors. I'm sorry that I missed this before. We don't offer the schematics at this point but it might be subject to change in the future. oh ok, so your own store isn't permanent? but there will be a time corridor in which you will be offering both pcbs and panels in your own store? please do let us know when that moment has come - i don't want to miss it. Our own store is only for the start up period of the company. Yes we can definetly announce when PCB's and panels are available. VCSEQ finished this weekend, beautiful build and lots of fun! Hey folks! Just a quick heads-up that our friends at SynthCube are now (at the time of posting 6th May 2014) stocking VC Sequencer kits, assembled modules and pcbs. Also for those of you who missed their post in our Optodist thread there are also Optodist kits, assembled modules and pcbs available! Pin 10 on IC7 CD4516 controls direction. It is pulled to gnd via R28 1M. That makes it low when the switch is in middle/rev and high/vc position. With the switch in low/fwd position it feeds pin 10 from the +V rail through the 100K resistor in resistor network RN10 between pin 7 and 8. With the switch in high/vc position it feeds pin 1 of IC7 instead through the same 100k resistor in RN10. Pin 1 is pulled to gnd through R29 1M. To do voltage (gate) control of this, feed the gate signal (input protected for CMOS) for direction to pin 10. High gate = fwd, low gate = rev. Feed the gate signal for vc mode (input protected for CMOS) to pin 1. High gate = VC mode, low gate = fwd or rev mode depending on pin 10. A high gate on pin 1 always overrides fwd/rev mode. The top pin of the switch is connected to IC7 pin 10, bottom pin is connected to IC7 pin 1, so the modifications could be soldered on either the pins of IC7 or on the top and bottom pins on the switch. 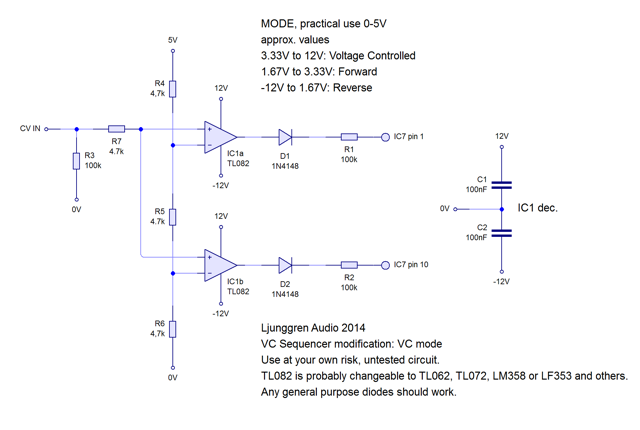 Also, here is a way to achieve voltage control over the 3 modes without the need for 2 separate gate inputs using a 0-5V control voltage, this circuit should work fine however it hasn't been tested, if you're insecure please consider testing it on a breadboard/stripboard before modding it onto the VC Sequencer. For all you who bought RYO products with warranty, please note that this will void your warranty so these modifications are done at your own risk! Nice one Steven, I wondered when you were going to!! @mindsnared: very cool, thanks for the modding info! think i'll go for the simpler gate-control-over-direction option - i don't feel that i need voltage control over all three modes. To do voltage (gate) control of this, feed the gate signal (input protected for CMOS) for direction to pin 10. "input protected" here means the same thing you show on the more complex cv option: i.e. put a 1n4148 diode + a 100k resistor between your gate input and pin 10, right? Yes, but I should also say that IC7 is run on 12V so it needs more than 5V gates. You could amplify it with a transistor and resistor and with the right transitor choice you could skip the diode. Like 2N7000. 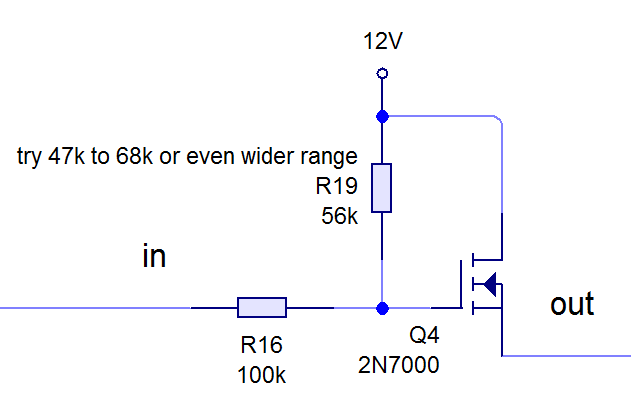 IC7 is run on 12V so it needs more than 5V gates. We said earlier we were going to have pcbs and panels available in the store, unfortunately we can't keep that promise since we're fully booked time and material-wise with vendor orders. We apologize for this, hopefully those of you in the EU can make due a little longer until Thonk stocks pcbs and panels as well as kits very soon.